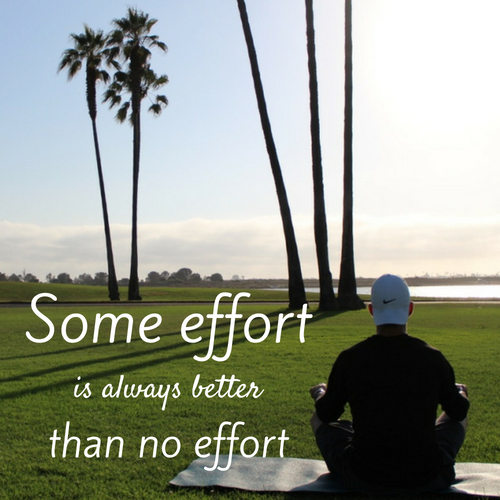 I’ve always been a big believer that some effort is better than no effort. A philosophy I adopted some time ago and have lived by ever since. In this case I was referring to exercise. Where some exercise, even if just 5 minutes, is definitely better than no exercise. I didn’t always think this way though. I use to think that if I didn’t have at least 45–60 minutes to exercise, why bother? That anything less than that wasn’t worth it. It’s like saying, if I can’t smile at someone at least 10 times today, I might as well not smile even once. If I can’t save at least $100 per month, I might as well not $5. If I can’t commit to at least one day per week to volunteer, I might as well not volunteer one day per month. If I can’t afford to buy my girlfriend at least a dozen roses, I might as well not get her just a single rose. None of these smaller efforts are worth doing if I’m unable to do more. Keeping the habit of smiling at people, even if just one smile. Keeping the habit of saving money, even if just a few dollars a month. Keeping the habit of volunteering my time, even if just an hour per month. Keeping the habit of brining my girlfriend flowers, even if just one rose. Some is always better than none. Because “some” maintains the habit. Which is much more important than the actual amount.